Witnesses reported hearing screams and seeing people trapped in the high-rise. A fire broke out about 1 a.m. Wednesday at a high-rise apartment building in west London. Police said at least six people were dead and that the figure was “likely to rise.” At least 50 people were taken to area hospitals, authorities said. LONDON ― Flames devoured a high-rise apartment building in west London early Wednesday morning, killing 6 people and injuring dozens more, authorities said. 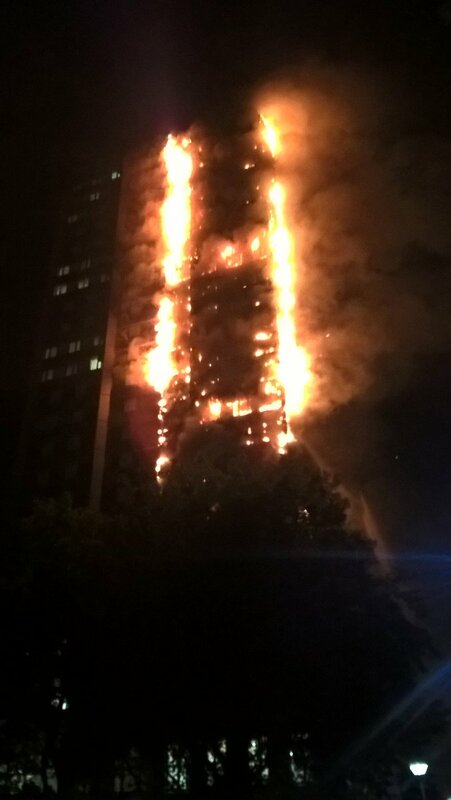 The 24-stories tall Grenfell Tower, in Kensington, was quickly consumed even as firefighters battled the flames throughout the night. At least 50 people were taken to area hospitals for treatment, London Ambulance Service said. London police said the number of fatalities is “likely to rise” in the coming days. Cotton said that the cause of the fire, which began around 1 a.m. local time, was still unknown. London Mayor Sadiq Khan, who declared the event a “serious incident” on Twitter early Wednesday, said that emergency services were unable to reach apartments on the highest floors due to the flames. A video recorded at the scene appears to include audio of people screaming for help from apartments inside the tower. Reporters spoke to several people at the scene who live near the complex and came out to witness the blaze. They described a scene of chaos and flame. “We saw people in the second top window of the tower. There were four people screaming and shouting and then the window went completely dark from the smoke and that part of the building was covered in flames,” her roommate, Line Sterring, said. The Guardian’s Alice Ross, at the scene, said she saw multiple people in the building waving blankets and flashing lights in an attempt to signal firefighters. One witness told HuffPost UK she saw a woman throw a baby out the window to try and save it. Residents told HuffPost UK that building management had previously advised them to “stay put” in their apartments in case of a fire. Luckily, not everyone heeded that advice. One resident told Channel4 News that he and his aunt escaped their 17th floor apartment after seeing the fire tear up the side of their building. The London Fire Brigade said 40 fire engines and 200 firefighters had been dispatched to the blaze, which had consumed almost every floor of parts of the building. London Ambulance service said that more than 100 medics were sent to the scene. “Crews wearing breathing apparatus and extended duration breathing apparatus have been working in extremely challenging and very difficult conditions to rescue people and bring this major fire under control,” Cotton said. Londoners were frantically searching for friends and family members in the building who were missing after the fire. Among the missing was a family of Syrian refugees, a woman who said she teaches their three daughters said. Catherine Lindsay told HuffPost UK that the family had recently moved to the U.K. and had been living in the apartment building. The Metropolitan Police urged people to stay out of the area, in the Kensington neighborhood, and several people said authorities marked off a perimeter around the apartment tower. Last year, a blog posted to a website that appears to represent residents of the Lancaster West Community, where Grenfell Tower is located, mentioned concerns about fire hazards in the complex as renovations were underway. Several blogs from 2013 voiced similar fears. The building recently went under a multi-million dollar reconstruction that was supposed to have included new fire-prevention features, according to two companies who said they were involved in the project. One of companies appears to have scrapped information about the project from their websites. In July 2009, six people died and more than 20 were injured following a blaze at the 12-story building in southeast London. Investigators later determined that the fire had been caused by a faulty portable television. U.K. officials, including former Housing Minister Gavin Barwell, are taking heat for failing to carry out a long-promised review of buildings’ fire regulations called for in the aftermath of the 2009 blaze. Barwell is now a top aide to British Prime Minister Theresa May. Previous The Sun Doesn’t Cause Skin Cancer, But Sunscreen Does! Who’s banned from entering the U.S. when Trump travel ban goes into effect?